Songhai Technologies Inc, a tech start-up company based in Texas USA, last week released Sierra Leone’s first comprehensive smartphone App to serve Sierra Leoneans at home and abroad. The App, unlike other types of locality apps that are mostly one dimensional in nature, provide a touch and go service and convenience for a myriad of resources and links to everything Sierra Leone and beyond. The founder of Songhai Technologies and developer of the App – Mr. Leslie Koroma of Texas USA, who is a US Citizen and was born in Sierra Leone, is an 18 years’ veteran of the tech industry. Leslie started out with his tenure at the former tech giant COMPAQ Computer Corporation, which was bought out a few years back by Hewlett Packard Corporation(HP). He is also the founder and CEO of African Sports Media Network – the first African media to deploy a digital online magazine to serve Africans around the world in African Sports Monthly Magazine. He also runs a daily Pan African sports news site called African Sports TV, where you can get your daily sports news from the motherland and beyond. Mr. Koroma’s rationale in developing the App, is to create a one stop shop center for a variety of needs for Sierra Leoneans and people interested in the country. This he says, will reduce the need to download multiple apps on a person’s phone for links that are within the app, thereby clearing a lot of space for other uses. 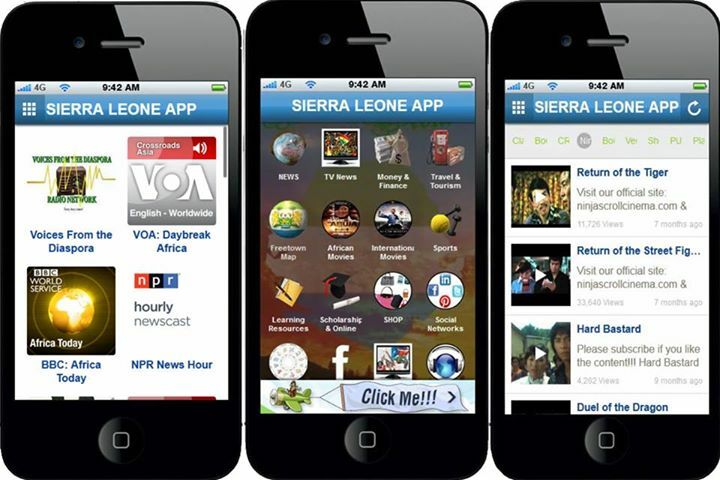 The App has a link for the most comprehensive aggregation of Sierra Leone news, Africa and beyond, that are updated daily as well as educational tools for students in the country. It also has an up to date weather link for visitors, as well as for Sierra Leoneans at home to keep an eye on the weather, courtesy of Accuweather.com. You can also find a variety of entertainment links from Nollywood to Bollywood movies. Songhai Technologies will be releasing other apps for other African nations, as well as other regions of the world, but customised to local market needs. Songhai Technologies is currently in talks with potential partners to include an application, that will allow the users of the app to make free and or cheap phone calls from the within the app to Sierra Leone. The Nigeria app, which is in the final phase of production and testing, is soon to be released. Cash for votes at constitutional change referendum?